This is a quick and easy way to get your veggies or maybe it can be a side dish. I started making this as a way to get veggies at least once a day. 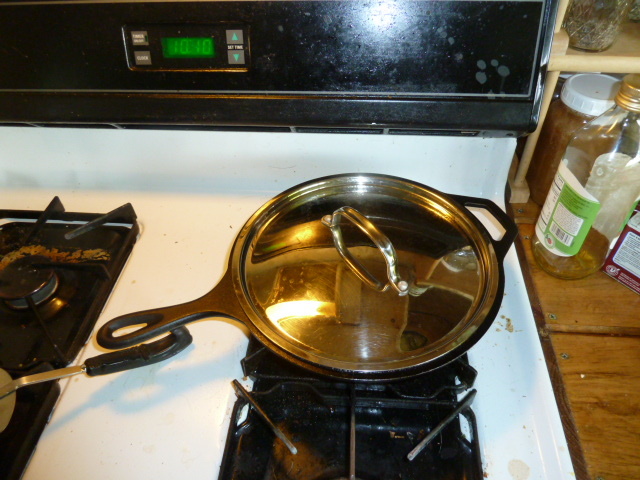 I start with a 8 inch or larger frying pan, cast iron is preferred. Place over low heat, add a little olive oil and 1/2 of a medium onion, garlic, sometimes I use dried garlic pieces, and a small potato chopped into 1/2 inch cubes. Stir fry these to get them coated with oil and browned a little. Next I add, sliced mushrooms, I buy the loose whole mushrooms, they are cheaper per pound than the packaged mushrooms, do not use the precut mushroom, they do not cook the same way as freshly cut mushrooms. Add one stalk celery, a carrot sliced or shredded, I buy the carrot already sliced or shredded, makes my life easier and not much difference between the fresh cut and the precut package, though they are more expensive. Now I use whatever I have on hand, a leaf of chinese cabbage, not the napa, but you could use that if you wish, I just like the tall thin chinese cabbage, a section of green pepper and part of a head of broccoli, all items chopped into bite sized pieces. I also add a bit of soy sauce or tamari, soy sauce has soy and wheat ingredients, tamari has just soy ingredients. I buy a quality brand, such as Kikkoman or San-J. I would stay away from the cheaper brands such as la choy, etc. I do buy by price, but compare the quality with the price, so you can choose the best option for your budget. I do have a quality brand of light soy sauce, light is not low-sodium, but decided I wanted to save the light soy for wok cooking. 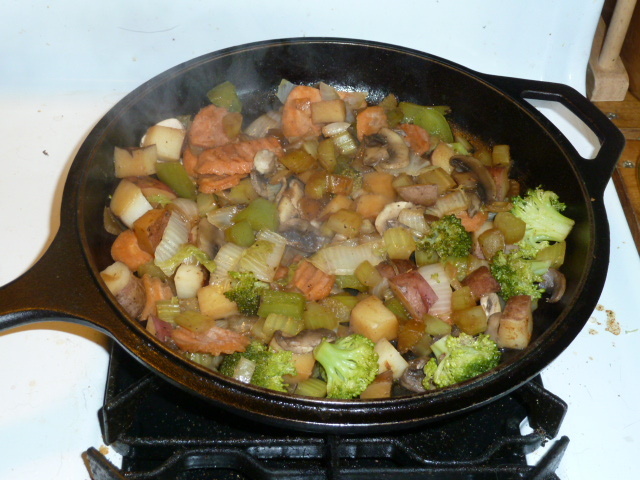 If you have added mushrooms, you may have enough liquid to cook the veggies, if not, add a bit of sherry, I use Taylor’s New York State Dry Sherry. This sherry costs about $5.00 a bottle, a medium tasting sherry. Other options include saki, chinese rice wine, or water. I would not use a sweet wine such as Harvey Bristol Cream Sherry. Sheffield Dry Sherry is another popular sherry which I would not use, I find that it is lacking in taste. My favorite sherry is Dry Sack, costs about $15.00 a bottle, but is well worth it as a sipping sherry, too expensive to use as a cooking wine. Anything labeled as a cooking wine should not be used, salt has been added to the cooking wine as to make it unpalatable as a sipping wine. Last but not least, I would add a spice blend, I like the blends that are on the hot and spicy side. I have used Creole, Cajun, Hot & Spicy, Herbal Cheese spice blends. I buy a lot of my herbs through an herbalist, but the food stores also carry blends to choose from. Stir and cover the pan, checking now and then to see if the potatoes are done yet, add liquid if needed. When the potatoes are done, I remove the cover and let the liquid reduce a bit to heighten the flavors. I have not given portions to use as you can make this a one portion meal or a side dish for a large family. I’m trying to add more veggies to my diet…I will definately try this!!! try to do a salad everyday.